Bretschneider established the law firm Davis Wills & Trusts in 2011, specializing in estate planning, trust administration, and family business planning. She graduated with a Bachelor’s from the UC Davis, a Master’s from the University of Freiburg, Germany, and a Juris Doctorate from the University of the Pacific, McGeorge School of Law in Sacramento. 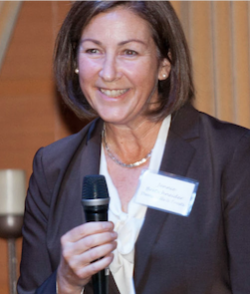 She served for many years as a consultant in the California Legislature and was Counsel to the California Secretary of State from 2007 to 2014. 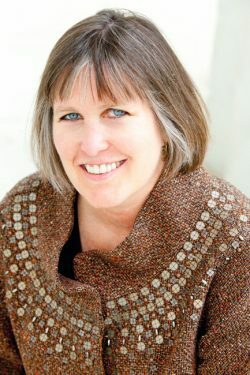 Bretschneider grew up in Silicon Valley, and she and her husband, Matthias, and their two kids, Yannick and Hanna, settled down in Davis in 1998. In Memoriam: Yolo Community Foundation Visionary Charles A Lacy. A pioneer who worked to establish and grow the Yolo Community Foundation has passed away. We are grateful to Charles A Lacy for his dedication and leadership over the years to build a community foundation that matches the philanthropic interests of donors with the needs and opportunities of the Yolo County community. He leaves a great legacy through the Yolo Community Foundation and will be greatly missed. More details can be found here. Yolo Community Foundation (YCF) is now recruiting for our next Executive Director. Details about the job specifications and how to apply can be found here. YCF currently has 55 funds valued at $4.3 million. We are seeking a visionary leader with nonprofit management experience to lead us into the future and continue to grow the organization and increase its visibility in the county. YCF seeks applications from high school seniors who have volunteered with a Yolo County nonprofit at least 60 hours during their junior and/or senior years of high school. YoYoSA student awardees will receive a $1000 scholarship to support post-high school education, which may include college, vocational or technical school. In addition, a $500 grant will be awarded to the nonprofit agency sponsoring each YoYoSA student scholarship winner. 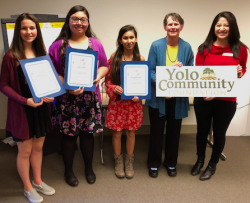 The YoYoSA program is designed to promote Yolo County youth volunteering with local nonprofit organizations and encourages Yolo County nonprofits to engage with youth volunteers. Applications are due March 8, 2019 and must be completed online. YoYoSA awardees and their sponsoring organizations will be recognized at a reception hosted by YCF in April. The Yolo Community Foundation held its 12th annual Philanthropy Day on November 15th and honored some of the most inspirational individuals in Yolo County. It was a powerful event highlighting dedicated people and organizations that have impacted Yolo County. The recognition event was held at the Woodland Opera House. All county nonprofits were invited to nominate people to be honored; six Yolo County nonprofits recognized donors and volunteers at the event. CommuniCare honored family nurse practitioner Lisa Yamauchi, who has been volunteering with CommuniCare since 1987. Mel Russell was recognized by the Friends of the Yolo County Archives for her project on Yolo County’s involvement in World War I, entitled “Lest We Forget.” Tuleyome honored founder and board president Andrew Fulks for his work to help establish the Berryessa Snow Mountain National Monument and his work on regional hiking trails. Cathy Murnighan was recognized for her work as executive director of the Twin Pines Cooperative Foundation, which is committed to the development of food cooperatives. Winters Robotics Inc. thanked the Escamilla Family who supports the Winters High School Robotics team. Dave Blatts was honored by the Yolo Food Bank for his over 2,500 hours of volunteer service. If you want to help our neighbors at this very challenging time, donations can be made to the North Valley Community Foundation at https://www.nvcf.org/fund/camp-fire-evacuation-relief-fund/. Yolo Community Foundation fundholders can make a grant through their funds or directly through nvcf.org website. Thank you for your compassion and generosity. Meg Stallard, president of the board of the Yolo Community Foundation, invites Yolo County residents to the twelfth annual Yolo County Philanthropy Day Celebration. The event will be on Thursday, November 15, 2018 at the Woodland Opera House, 340 2nd Main Street, Woodland, from 5:30 to 7:00 p.m.
“The Yolo Community Foundation organizes this celebration to bring attention to the impact and importance of local philanthropy. 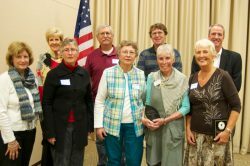 It’s wonderful to be able to honor the generous donors and volunteers of Yolo County,” said Stallard. Meg Stallard, president of the board of the Yolo Community Foundation, announced that the twelth annual Yolo County Philanthropy Day Celebration will be held on Thursday, November 15, 2018 at the Woodland Opera House, 340 2nd Main Street, Woodland, from 5:30 to 7:00 p.m. The Yolo Community Foundation (YCF) is pleased to announce its second round of funding for its Buck Education Grant Program. The program aims to support new or existing education efforts in Yolo County that can scale over the course of a two to three year period. In its inaugural year, the Yolo Community Foundation provided grants to the Center for Land-Based Learning, the Davis Arts Center, the MK Level Playing Field Institute, Tuleyome, the Yolo Basin Foundation and YoloArts. Two grants were awarded to programs in the School of Education at UC Davis. Proposals are due October 31, 2018 by 5 p.m. Information and instructions for applying can be found here. On Thursday, April 19 the Yolo Community Foundation (YCF) recognized the recipients of the YoYoSA scholarships at a reception in their honor. Rosaamelia Cordova of Woodland High School, Amanda Nazario of Davis Senior High School, and Julia Escamilla of Winters High School were all recognized as scholarship recipients at the Yolo Youth Service Awards (YoYoSA) and will each receive $1000 scholarship to support post-high school education, which may include college, vocational, or technical school. The YoYoSA program is designed to promote and reward Yolo County youth volunteering with local nonprofit organizations and encourages Yolo County nonprofits to engage with youth volunteers. Cordova is a member of the Woodland Public Library Teen Advisory Board, Nazario volunteers with Yolo Food Bank, and Escamilla works with Winters Robotics, Inc. All of these nonprofit organizations were awarded a $500 grant sponsoring each YoYoSA student scholarship recipient. YCF strives to boost local philanthropy by serving donors, nonprofits, and youth in the Yolo County area, and is proud to recognize tomorrow’s leaders in local philanthropy through the YoYoSA program. For more information about YCF, please visit its website at www.yolocf.org. Reception and recognition of Yolo Youth Service Awards (YoYoSA) scholarship recipients. 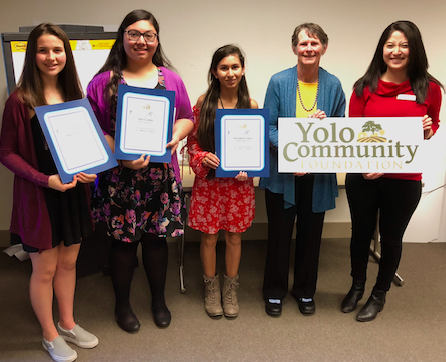 At 5:30 PM on Thursday, April 19 the Yolo Community Foundation (YCF) will be recognizing the recipients of the YoYoSA scholarships at the Yolo County CASA Conference Room in Woodland, CA (located inside Yolo County CASA 722b Main Street, Woodland, CA). The YoYoSA student awardees will each receive a $1000 scholarship to support post-high school education, which may include college, vocational, or technical school. A $500 grant will be awarded to each nonprofit agency sponsoring each YoYoSA student scholarship recipients. Student awardees and sponsoring nonprofit agencies will be honored at the reception. or call 530-312-0593 by April 17th. The Yolo Community Foundation (YCF) welcomes Rafael Galiano and Marissa Sirota to its 2018 Board of Trustees. The mission of YCF is to match the philanthropic interests of donors with the needs and opportunities of the Yolo County community. YCF is excited about the addition of these two new board members and looks forward to their contributions to the organization. 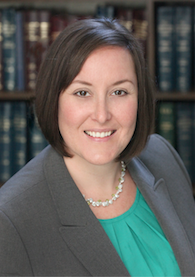 Marissa Sirota is a self-employed trust and estate attorney. She has finished her sixth year as a California licensed attorney and 2018 will be her fifth year in her solo estate practice. Her career has exposed her to a variety of individuals with different perspectives. She works with people on their estate planning as well as administration. In her estate planning she often has clients with charitable desires but whom do not always know how to go about setting something up on their own that will meet their charitable goals. “I think it is wonderful that Yolo Community Foundation allows residents to have options to have such a direct, local, and positive impact in their own communities. My personal belief in charitable giving is that it is most satisfying to act locally (even while thinking globally) in order to help create a local community that reflects the type of world we wish for our son to grow up in,” says Sirota. Rafael Galiano and his partner, John Martin own a venue called Park Winters. They have donated their property and have collaborated with many nonprofits to raise money for their foundations, including: CASA, Yolo Farm to Fork, The Wreath Foundation, political fundraisers, Yolo Land Trust and 3R Dog Rescue. They have participated in events with the Center for Land Based Learning and the Food Literacy Center. Galiano finds it a great joy working with these organizations to raise funds for their efforts. Recently, he was appointed to be the Fire Commissioner for the Madison fire district in western Yolo County. “I am interested in working with the Yolo Community Foundation. I want to help our community by providing support to companies and donors with their philanthropic efforts,” says Galiano. Applications are due March 9, 2018 and must be completed online. YoYoSA awardees and their sponsoring organizations will be recognized at a reception hosted by YCF in April. Meg Stallard, president of the board of the Yolo Community Foundation, announced that nine Yolo County programs for youth will be funded in early 2018 through the Buck Education Grant Program of the Yolo Community Foundation. The former Frank H and Eva Buck Foundation provided the Yolo Community Foundation with nearly $240,000 to grant out to the community. There will be two more granting cycles in the coming years. These grants are designed to enhance and develop local science, technology, engineering, arts and math programs, also known as STEAM, support parent engagement efforts, and grow literacy programs for youth from pre-school through high school. Twenty-six organizations applied for funding in this inaugural grant cycle. Grants were awarded to the Center for Land-Based Learning, the Davis Arts Center, the Knight’s Landing Children’s Center, the MK Level Playing Field Institute, Tuleyome, the Yolo Basin Foundation, and YoloArts. Two grants were awarded to programs in the School of Education at UC Davis. An affiliate of the Sacramento Region Community Foundation, the mission of the Yolo Community Foundation is to inspire and support giving and to provide philanthropic leadership in our community. Meg Stallard, president of the board of the Yolo Community Foundation, announced that the eleventh annual Yolo County Philanthropy Day Celebration will be held on Thursday, November 16, 2017 at the Woodland Opera House, 340 2nd Main Street, Woodland, from 5:30 to 7:00 p.m.
Information on participating in this event will be circulated to the local nonprofit community. Nominations are due November 2nd. Announcing the Yolo Community Foundation (YCF) Buck Education Grant Program! Its purpose is to support new or existing education efforts in Yolo County that can scale over the course of a two to three year period. Grant requests of any amount up to $10,000 will be considered. YCF Buck Education Grants will fund a variety of projects and activities within the field of early childhood and K-12 education in Yolo County. The Foundation seeks to fund projects that create a path to sustainability. Grantees may be invited for a second round of funding to scale up. Proposals are due by 5 p.m. on October 31, 2017. Details about the program and information about how to apply can be found here. Thank you to the 19 Yolo County-based nonprofits that participated in this year’s Big Day of Giving midday celebration and the 79 Yolo County-based nonprofits that participated in the Big Day of Giving this year! On Thursday, April 20 the Yolo Community Foundation (YCF) recognized the recipients of the YoYoSA scholarships at a reception in their honor. Cooper Hosley of Davis Senior High School, Omoyele Oyesanya of Pioneer High School, and Trinidad Santos of Winters High School were all recognized as scholarship recipients at the Yolo Youth Service Awards (YoYoSA) and will each receive $1000 scholarship to support post-high school education, which may include college, vocational, or technical school. Hosley volunteers for TEAM Davis, Oyesanya is a member of the Teen Advisory Board of the Woodland Public Library, and Santos works with the Interact Club, affiliated with Rotary, at Winters High School. All of these nonprofit organizations were awarded a $500 grant sponsoring each YoYoSA student scholarship recipient. The application deadline for the Yolo Youth Service Award and the Burns-Bellhorn and Timothy Casson Memorial Scholarship Funds has now passed. Thank you for your interest! Applications are due March 1, 2017 and must be completed online. YoYoSA awardees and their sponsoring organizations will be recognized at a reception hosted by YCF in April. Meg Stallard, President of the Board of the Yolo Community Foundation, announced that the tenth annual Yolo County Philanthropy Day will be held on Thursday, November 17, 2016 at the Historic Hotel Woodland, 436 Main Street, Woodland, from 5:30 to 7:00 p.m. Read more here! Thank you to our generous donors and match donors during the 2016 BIG Day of Giving! With your support, we were able to raise $16,125 to help grow Yolo Community Foundation programming. We are grateful! We would also like to thank the organizations and individuals that supported the Yolo Prize Pool, including Nugget Markets, Yolo Federal Credit Union, Chan Family Fund, Sue Heitman, Joe Muller and Sons Farm, Todd Montgomery, CPA, and Inn at Park Winters. Meg Stallard, President of the Board of the Yolo Community Foundation, announced that the tenth annual Yolo County Philanthropy Day will be held on Thursday, November 17, 2016 at the Historic Hotel Woodland, 436 Main Street, Woodland, from 5:30 to 7:00 p.m.
Yolo Community Foundation President Meg Stallard announced that Beverly “Babs” Sandeen was named the foundation’s executive director through an arrangement with the American Leadership Forum-Mountain Valley Chapter’s Encore Fellowship program. Sandeen is scheduled to take up her post in early January with responsibility for foundation oversight and fundraising strategy. She follows Dan DeSantis, who served as Executive Director of the foundation since 2014. Sandeen has held senior fundraising and management posts, serving as Vice Chancellor of Resource Development at Los Rios Community College District and President of the Los Rios Foundation since 2012, and before that as Vice Chancellor of University Advancement and President of the UC Davis Foundation at UC Davis, where she was responsible for launching the first comprehensive campaign that raised $1.13 billion for the campus. 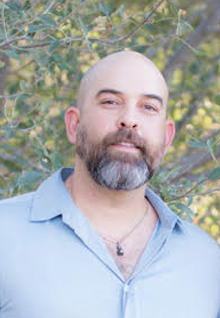 Sandeen has a bachelor’s degree in political science and a doctorate in social ecology from UC Irvine. In addition to her work in higher education, Sandeen also served briefly as a consultant to the automobile industry. She has served on many regional boards, including the American Leadership Forum, Sacramento Metropolitan Chamber of Commerce, Sacramento Valley Conservancy, Woodland Opera House, and Yolo Community Foundation. She is a graduate of the FBI Citizen’s Academy. Sandeen currently serves on the city council in West Sacramento. Bonnie Ferreira, the CEO of the American Leadership Forum’s Mountain Valley Chapter, said that “There is no one more qualified to lead the Yolo Community Foundation. Babs has a proven track record of leading foundations. She operates from a space of personal integrity and incredibly high intellect.” Sandeen also chaired the Sacramento Metropolitan Chamber of Commerce’s Cap-to-Cap program in 2013 and was recognized by the chamber as the 2013 Volunteer of the Year. In 2014, she was named one of the Sacramento Business Journal’s Women Who Mean Business. At the Los Rios Community College District, Sandeen played a critical role in raising the visibility of the foundation’s work through involvement in the region’s Big Day of Giving and by organizing the 50th anniversary gala recognizing alumni and donors. During her tenure at Los Rios, $37.9 million in grant funding was secured from federal, state, and private sources and $5.8 million in private support was raised. Sandeen recently co-chaired the Council for the Advancement and Support of Education’s national Conference on Community College Advancement and serves on the board of the Network of California Community College Foundations. The mission of the Yolo Community Foundation is to inspire and support giving and to provide philanthropic leadership in the community. It gives scholarships to Yolo County high school seniors who have worked with nonprofit agencies – the Yolo Youth Service Awards; organizes a Philanthropy Day celebration; and supports the efforts of nonprofit agencies in Yolo County. The Foundation is also a sponsor of the Big Day of Giving. For more information, call 530-312-0593 or www.yolocf.org. Yolo Community Foundation is an affiliate partner of the Sacramento Region Community Foundation. The Yolo Land Trust honored Carole Pirruccello and Diana Davidson, trustees of the John and Eunice Davidson Fund for their financial support of the Land Trust over several years. CommuniCare Health Centers honored contractor, donor and volunteer Scott Maxwell, who has had a hand in building CommuniCare’s facilities for many years. The Yolo Food Bank honored volunteers Dave and Ed Ellis, a father and son team who began volunteering when their son/brother began working as the volunteer coordinator of the Food Bank. MaryJo Bryan was honored by Suicide Prevention of Yolo County for her many years as a board member and volunteer. She was also recognized by the Yolo Community Foundation for her service to that organization. The Pence Gallery honored Sue Smith, who has been Co-President since 2006. Sue has coordinated the successful Pence garden tour for eight years, among other activities. Yolo Farm to Fork honored longtime volunteer Dorothy Peterson, who began teaching gardening to school children in the 1990s before the Farm to Fork movement became fashionable. Fourth and Hope in Woodland honored volunteer cooks Jackie Scott and Roz Stone, who have provided nourishing meals to homeless people on a regular basis for many years. The Foundation also welcomed organizations and individuals and families who have opened new funds during the year. The organizations include the Davis Arts Center, Putah Creek Council, the City of Winters, the Yolo County Historical Society, Yolo County CASA, the Yolo County Children’s Alliance, and First 5 Yolo. New Donor Advised Funds have been opened by the Chan family, the Luna family, the Roe family, Martha West, Bill Julian and Robin Kulakow, the Weiss family, and the Douglas family. The mission of the Yolo Community Foundation is to inspire and support giving and to provide philanthropic leadership in our community. It gives scholarships to Yolo County high school seniors who have worked with nonprofit agencies – the Yolo Youth Service Awards; sponsors Philanthropy Day; and supports the efforts of nonprofit agencies in Yolo County. The Foundation is also a sponsor of the Big Day of Giving. For more information, call 530-312-0593 or www.yolocf.org. Yolo Community Foundation is an affiliate partner of the Sacramento Region Community Foundation.